There's nothing prettier than wearing braids to a wedding. The hairstyle perfectly complements the romantic ambience, not to mention your gorgeous outfit. 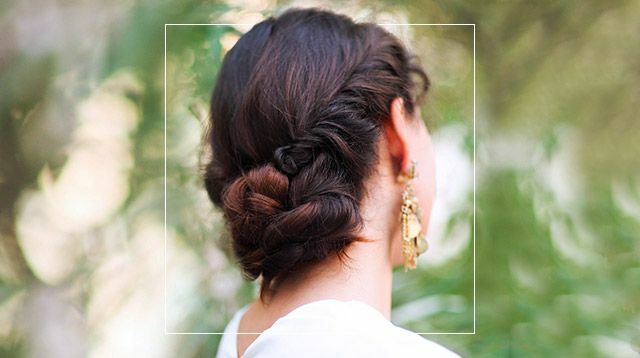 Whether you're a wedding guest or bride-to-be, you'll love to be seen in these plaited 'dos. 1. Worried about your roots showing? Make them the highlight of your updo with an upside-down French braid bun. 2. A wedding day hairstyle doesn't always need to be curled. A neatly done braided half-updo will do. 3. Of course, a classic braided bun should be one of your options! 4. Try a fishtail braid for a change—it's wide and flat, which secures its form and shape all day. 5. Add a fun spin to an otherwise ordinary-looking side-braid by using hairpins to create a pattern on your hair. 6. Braid the top section of your hair to lengthen the shape of your face—the plaited center part downplays chubby cheeks! 7. This one is ultra simple and you can definitely do it by yourself: Wear your locks down and braid a tiny section of the hair. This will serve as your hair accent.